The Caterpillar (CAT) Company is widely known for making dependable work machinery and equipment, but that’s not the only area in which they are skilled. CAT produces high-end apparel that's reliable, comfort, and durable. That’s why you need to score yourself ... (see full details) (see specifications) #1510296-11103. The Caterpillar (CAT) Company is widely known for making dependable work machinery and equipment, but that’s not the only area in which they are skilled. CAT produces high-end apparel that's reliable, comfort, and durable. That’s why you need to score yourself one of these CAT Apparel Men's 1510296 11103 Heather Grey Flag Custom Logo Short-Sleeve Tee Shirts. Introducing a new, innovative design: this men's short-sleeve tee shirt is bound to look good on and of the clock. When you feel this CAT Apparel heather grey tee shirt, you'll find that it feels softer than other designs you might've worn in the past. This is due to the logo shirt being made of comfortable cotton that's light, breathable, and extremely soft. That is why this custom logo tee shirt feels extra soft and comfortable! For added comfort, this short-sleeve tee also features a tagless neck design. This means that there's no annoying tag (or any tag at all) that constantly scratches at your neck. Choose tagless for the win! Men like to own versatile clothing options that can be worn anywhere. Lucky for you, this CAT Apparel tee shirt meets your style needs, too. The short-sleeve design is lightweight and fun. The heather grey fabric is stylish and will match with a variety of thing in your closet. On the front of the work shirt, you see a cool CAT printed logo in bold letters. This men's workwear features the all-new design mark pattern that you see on the logo. This offers a trendy new look that's sure to make you fall in love. 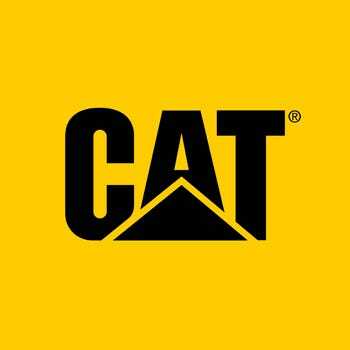 When you choose CAT Apparel, you're choosing workwear that's extremely durable and reliable. This heather grey logo short-sleeve tee shirt is no exception. It's constructed with tough material that fights against rips, tears, and snags. Plus, this grey tee is easy to clean and care for as well. For added durability, this features rib trim with Spandex design. This helps the garment keeps its shape through every wash and wear. If you want a men's shirt you can depend on, this is the one for you! If you’ve ever jammed out to music while you work (and chances are you have), you know that your headphone cords flip and fly around every which way. There’s always that chance that the cord can get caught onto something in your work environment and cause all kinds of dangerous trouble. That’s why this CAT Apparel men’s short-sleeve tee is designed with a wire management loop on the back of the neck. This little loop will secure your cords and increase your job site safety. Rock on! This logo tee is comfortable, soft, durable, stylish, and increases job site safety. You really can’t ask for anything more than that! Get your CAT Apparel Men's 1510296 11103 Heather Grey Flag Custom Logo Short-Sleeve Tee Shirt from Working Person’s Store today. Once you place your order, you'll soon have dependable CAT Apparel gear for work or play. CAT Apparel Shirts: Men's 1510296 11103 Heather Grey Flag Custom Logo Short-Sleeve Tee Shirt is being added to your cart.